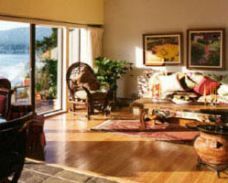 Silky's island B&B guest house in Campbell River on Vancouver Island invites you to kick off your shoes, read a book or just gaze at the spectacular view through windows that look out onto Discovery Passage and Northern Quadra Island. The living room is awash with sunlight and sunsets. Each room has an ocean view and is designed for comfort, to encourage a sense of peace and to enhance your senses. These waterfront lodgings are more than a bed and breakfast: It's a "feel at home" guest house.